For ten grim years, the Spider battled the underworld, imprinting his scarlet seal on the bodies of the criminals he slew. No one knew his name. His face was unknown. Pursued by the police, sought by the mob, the Master of Men crushed crime with a blazing intensity never witnessed before or since. 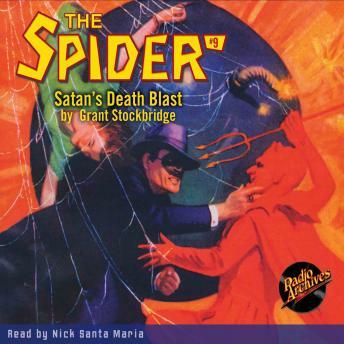 Now he's back in a series of riveting audiobooks adapting his most intense adventures from the pulpy pages of The Spider magazine, as chronicled by Norvell W. Page, writing as Grant Stockbridge. Here, The Master of Men fights against the Satan's Death Blast!